Two 19th-century business blocks anchor the lower side of Superior Street’s West 100 block, the Lonsdale and Providence buildings. Both were designed by prominent Duluth architects and first constructed in 1895, and later several floors were added to each. But while the Lonsdale still looks remarkably close to its architects’ original drawings, today the Providence would not be recognized by the men who drew up its plans. The building may no longer look as grand as it once did, but the man who built has a titanic connection to history. William B. Silvey was born the son of a U. S. Army engineer in Washington D.C. in 1862, as war raged around the nation’s capital. Little is known of his early life or education, but by the time he was 27 he had landed in the Zenith City and entered the local real estate game while Duluth was rapidly expanding. He invested in the West Duluth Land Company, expanded his services to include mortgage loans, and joined the Commercial Club. He also dove head deep into Duluth society, joining the Kitchi Gammi Club and courting Alice Munger, daughter of prominent Duluth businessman and pioneer Roger Munger and his wife Olive. The Mungers became just the 14th family to call Duluth home when they moved to the Zenith City from St. Paul in 1868; Mr. Munger built the first lumber mill in Duluth Township, owned grain elevators and helped establish the Duluth Board of Trade, and invested in Duluth’s first two commercial flour mills, among other accomplishments. His connections among Duluth businessmen were myriad, and soon so were Silvey’s. When Silvey and Alice wed on June 26, 1893, it was the social event of the season. Her bridesmaids included the daughters of two former Duluth mayors and her sister, Mary, the bride of Dwight Woodbridge, a mining engineer who in 1910 would coauthor the first history of Duluth and St. Louis County. The Silveys’ names often appeared in the society columns of Duluth’s newspapers during the first 20 years of their marriage. 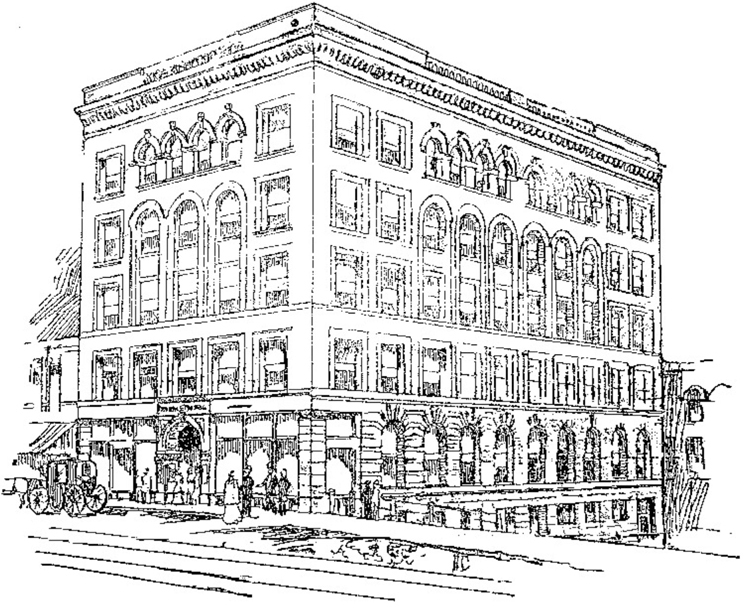 Articles in the Duluth News Tribune also indicate that William Silvey became close friends with Captain Robert Torrey, who lived in Duluth during the 1890s after he built the Torrey Building at 314 West Superior Street in 1892. The newspaper reported often on Torrey and Silvey’s hunting trips, and Silvey kept an office on the sixth floor of Torrey’s building. Where the above architects have their offices is generally considered to be one of the best planned office buildings in Duluth, and this building, with a number of other business and tenement blocks and private residences planned by Wangenstein & Bailie during their long professional career in Duluth bear evidence to their skill as architects. When completed in May 1895, the Providence stood five stories high along Superior Street, six along Michigan Street. It was essentially a Romanesque office building made of red brick with brownstone details. A one-story arched stone entryway provided access along Superior Street. The central windows of the third and fourth floors were visually tied together with brownstone trim and arched above the windows on the fourth floor. The central bank of windows on the fifth floor were oval, creating more visual interest. The building was crowned with an ornate cornice. Silvey proudly advertised the building as fireproof. Beside an iron girder skeleton, the building included a central fire vault made of clay that reached to the top floor and was accessed by steel door. Wangenstein and Bailey must have been pleased with their work, as they moved their offices into the Providence as soon as it opened. Other initial tenants included the offices of the Northern Pacific Railroad on the first floor. Lewis Merritt traded stock in copper and iron mines out of the Providence, and many insurance companies made their home there. In 1912 Silvey reinvested in his building by adding more office space, an idea many of his fellow office-block owners had employed with great success. Silvey spent $50,000 adding two floors between the original fourth and fifth floors following plans drawn by Wangenstein. When complete, the building stood seven stories above Superior Street, eight above Michigan. My husband and I had retired but were not yet asleep, when we felt the jar of the collision. We did not feel it much but those on other parts of the ship say it was tremendous. I’d heard a commotion on deck and got up and dressed. When we arrived on deck we learned the cause and then went back and put on warmer clothing. When we returned the sailors were getting out the boats and Mr. Silvey placed me in one of them and said that he would follow in one of the other boats. Alice Silvey sold the Silvey Block and Superior Hotel buildings, but held on to other properties, including the Providence Building. She moved to New York City in 1914 but returned in 1918 to marry Richard Stedman Patrick, described in a 1960 article as an “industrial diamond import-export dealer.” Patrick’s job left him ample time to master the links at Northland Country Club and other local courses, as his name is mentioned frequently in Duluth newspaper articles regarding local golf tournaments. Patrick died in 1949; Alice Munger Silvey Patrick died in 1958. Meanwhile the Providence Block saw tenants come and go. In 1934 the building underwent a $50,000 “modernization,” which altered the façade of the first two floors along Superior Street. The renovation included prominent signage for the building’s anchor tenant, St. Louis County Savings & Loans, which purchased the Providence Block in 1944. In 1982 the building received a major renovation that cost $184,000. Interior work included removing the central fire vault. On the exterior, the building’s oval and arched windows—including the brownstone trim that surrounded them—were removed and discarded along with much of the original brick. The building’s façade is now alternating vertical columns of brick and steel-framed windows. There is one thing that has not changed about the Providence over the years. It is still home to an insurance company. In fact, Duluth’s Otis-Magie Insurance now owns the building.